Speedhunters loves tales of no-compromise street builds, and we recently had the chance to spend some time in the mountains above LA with a very special Lotus Elise – one that happens to be powered by one of the all-time greats of the four cylinder world: the Honda K20A from a DC5 Integra Type R.
Speedhunters: First up, tell us a little bit about your personal automotive history and the cars you owned before this one. 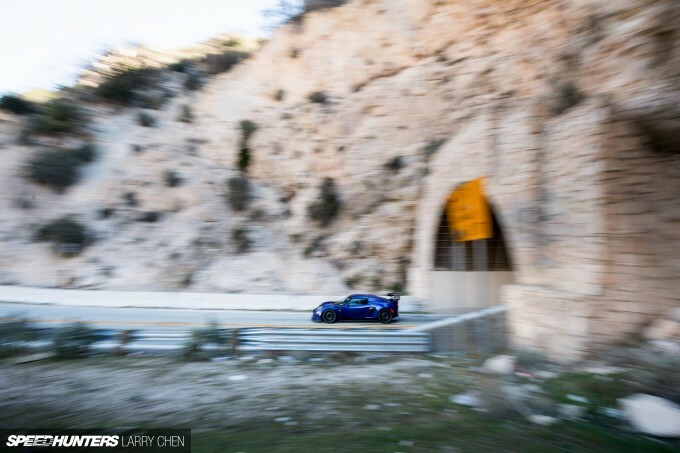 Chris Nguyen: Well, I started out my automotive adventures as a Bavarian fanboy and remained one for a long time throughout high school and college. I’ve owned a BMW E36 M3 and Z3 M Coupe before this car. These were terrific sports cars, but well-aged examples and these generations of BMWs had a lot of structural issues (cracking subframes, broken differential mounts). Coupled with the aging cooling system components that left me stranded more than once and with a lot of expensive repairs that couldn’t be justified anymore, I decided to branch out towards different car brands. 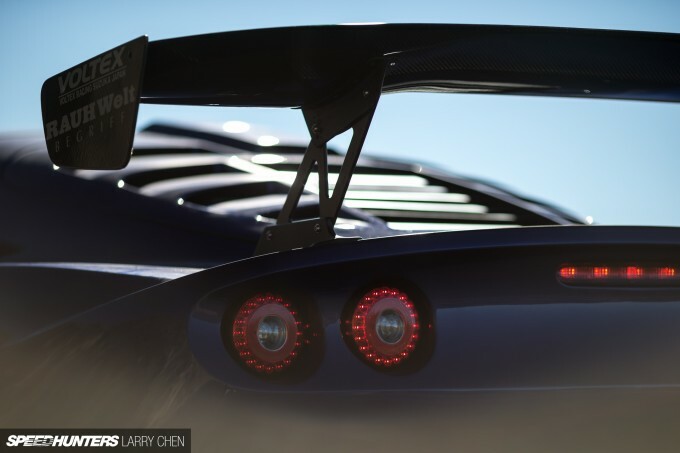 SH: How and why did you end up settling on an Elise as your next project? CN: I hadn’t had the Lotus in mind initially. I looked at several classic Japanese sportscars, like the RX-7, but knew I wanted one with a cool engine swap as I didn’t want to deal with the exciting atmospheric-revving, but also very finicky rotary engine. At the time, LS1 RX-7s were becoming popular and I almost bit the bullet on a red FD3S V8 example. I also almost bought a blue SR20DET 260Z and even considered a classic Mini with a Honda B18! As you can see, the idea of an engine swap was well planted in my brain, but ultimately I became smitten with the idea of owning an exotic sportscar like the Lotus Elise and focused my attention and search towards that. It had the unique rarity and looks, telepathic lightweight handling, a price point that was within my range, combined with the reliability of a Toyota drivetrain. What was not to love? 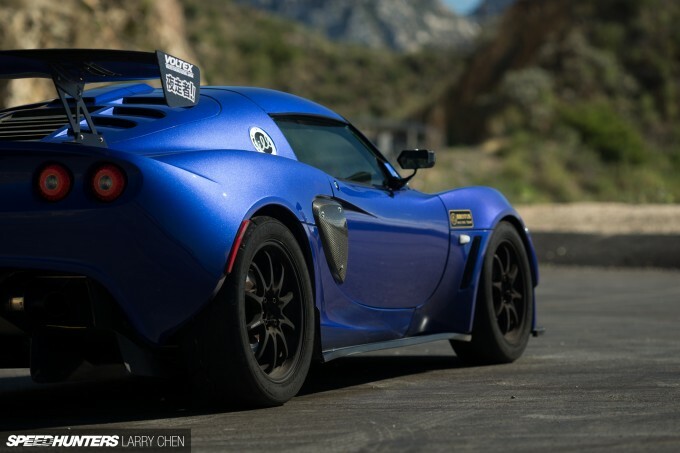 The Lotus Elise was sold in the US beginning in 2005 and I bought my car in 2009. 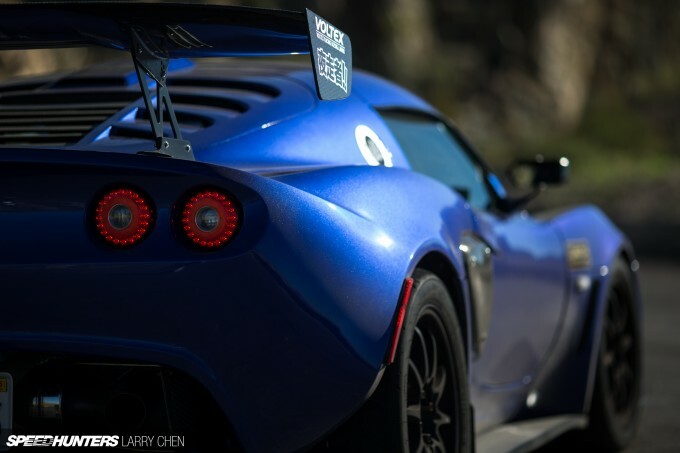 At that time, Lotus Elise sales had plunged since everyone in the market for such a car already bought one in 2005. Eventually, the used car market was flooded with Lotus Elises from owners that either hadn’t anticipated how impractical a small, two-seat plastic and aluminum British sportscar could be, or had been adversely affected by the financial crisis. Or both. I was fortunate enough to be able to find a 2005 Magnetic Blue example for a much lower than the average selling price at the time (depreciation had taken a huge hit on this extremely niche vehicle). 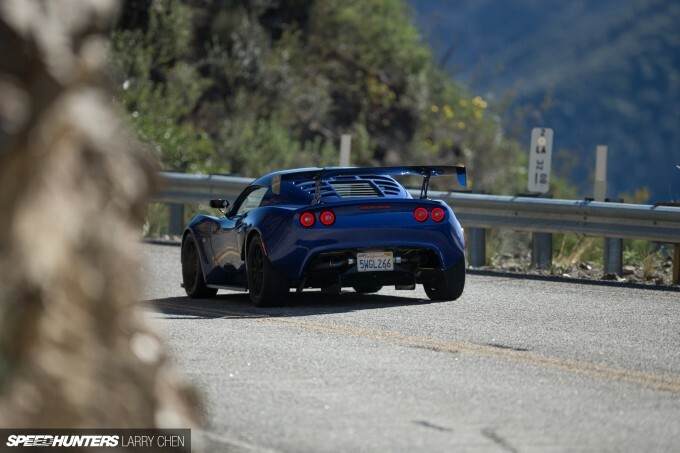 Ironically, now that Lotus has ceased Elise/Exige production for the US market, their values have skyrocketed. The previous owner was one of those people who probably had been hit hard by the economy as he seemed to be a struggling Hollywood actor (I found his portfolio under the driver seat a few weeks after buying it). I gave him a pretty aggressive lowball and was surprised that he accepted it. Later on, I found out why. The car drove fine initially, but very soon after I began experiencing shifting issues and crunching synchro in 2nd gear. I found this odd as the car only had just 18,000 miles on it. I eventually had to have the transmission repaired at quite an expense, but I still came out ahead given the amount I had paid for the car versus market value. But looking up the previous owner on Google revealed why the car had suffered a bad synchro so early on. I found a Myspace video of him racing David Hasselhoff’s Lamborghini Gallardo – and losing badly. Looking back, it’s funny knowing my car ‘hassled the ‘Hoff’ and paid the price for it! SH: How did the modifications start? Take us through your early days with the car. CN: The car began as my daily driver, but shortly after I got bit by the mod bug and it slowly morphed into my track car with occasional weekend duty. I upgraded the suspension with Nitron Single adjustable coilovers, and the brakes with more aggressive Carbotech pads and 2-piece floating rotors from BOE Racing. I also opted for more aggressive Toyo R888 tires and lightweight RAYS Volk Racing CE28Ns – staggered 16-inch front and 17-inch rear with cool 8-spoke and 10-spoke designs. 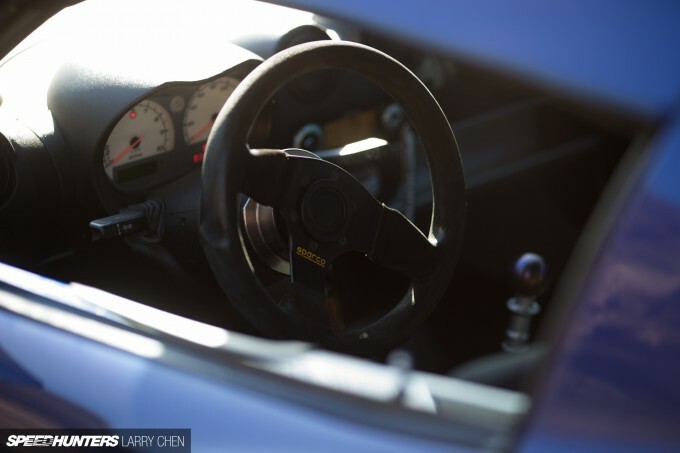 The interior also got revised with a Recaro SPG seat, Willans harnesses and Lotus Sport harness bar, aspec titanium shift knob, Sparco Cup steering wheel and a Works Bell quick-release hub. I fitted a titanium Arqray single exit exhaust which gave the car an aggressive hollow scream at full throttle. My favorite part about the car was the steering feel, but believe or not it can be further improved from factory with the addition of V2 Motorsport steering arms that allow more camber to be dialed in and a quicker steering rack. I began going to track days more frequently and improving my own driving skills around tracks like Buttonwillow and Auto Club Speedway. But with it also being a street car, it suffered some parking lot incidents that necessitated a full fiberglass clamshell replacement since the entire front clip is one large piece. 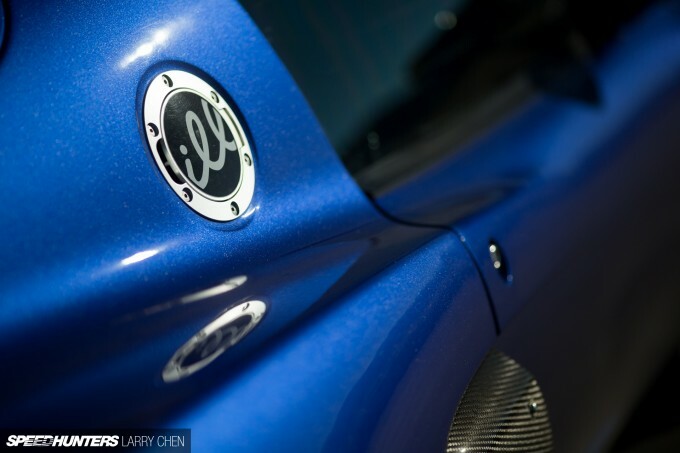 I had Julio at Mulholland Motorsports replace the front Elise clamshell with an Exige one that had the insect-like inner turn signals filled in and relocated to the main headlight for a cleaner look that also made it seem wider visually. Eventually the abuse from the previous owner and the continued track duty I was putting on the car caused the engine to fail at one particular Buttonwillow event in April, 2012. An oil pump failure led to oil starvation, a thrown rod bearing, and badly damaged valve rockers and camshafts. 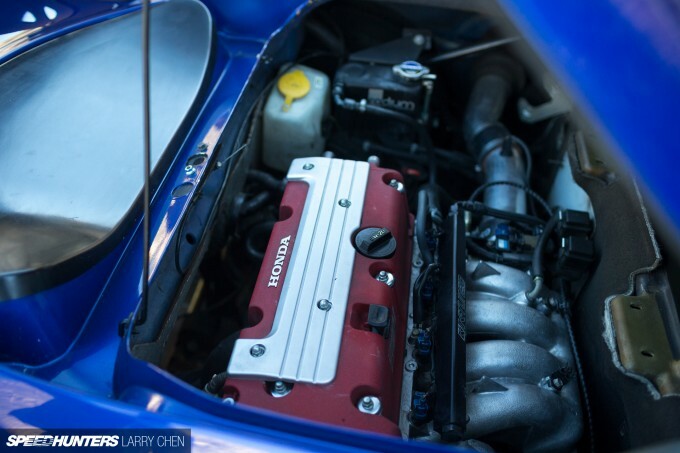 SH: Why did you choose to go with a Honda engine swap rather than sticking with the Toyota 2ZZ motor? CN: The original engine was basically toast and I was left with a couple options. 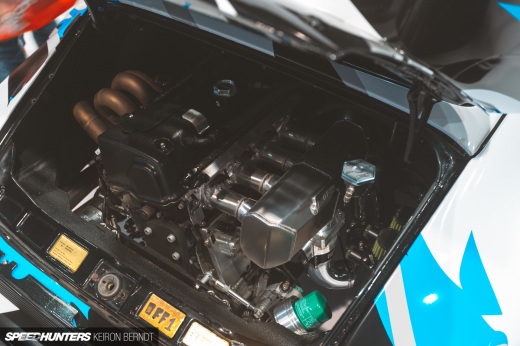 One – replace the engine with a built 2ZZ to withstand the track duty, or two – consider a different engine that was more reliable, had higher output potential with a larger aftermarket, and cost only a little more than fully building up a 2ZZ. I decided to go with option two: the Honda K-series motor. I was introduced by my Honda track buddies to Loi Song from Sportcar Motion, a Honda specialist in San Diego, California. 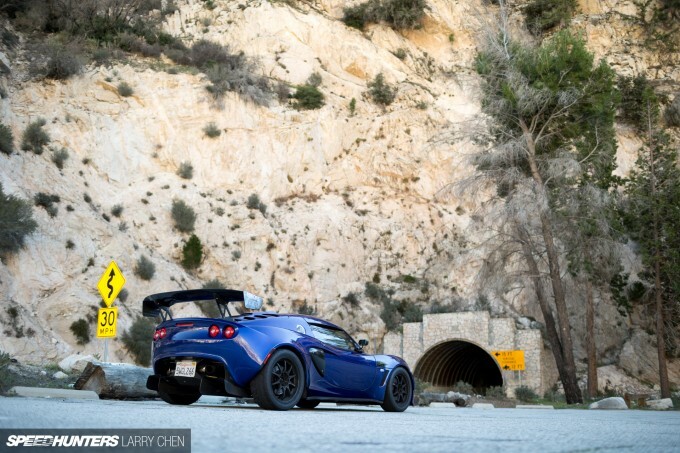 I left the build in his hands as he had done several K-swaps before in cars like the Honda CR-Z, but the Lotus was a new challenge. There were already several Honda swaps in Europe, but that was with the slightly different Euro-spec chassis as opposed to the Federalized version in the USA. However, I discovered there was a swap kit for US cars as well from Tim at Innovative Mounts in Anaheim, California. 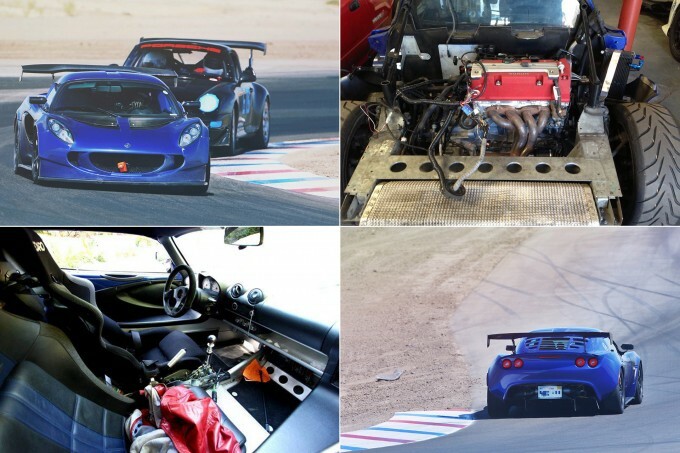 He had completed a K-swap in his track Exige, so I was optimistic that the process would be relatively simple. However, there were many unforeseen bumps along the way. One of the biggest challenges was logistics since Sportcar Motion was in SD and Innovative was in Anaheim. The car would end up spending half its time between the two shops going back and forth! SH: Tell us a little more about the specific engine setup you went with. What sort of changes had to be made for the K-series motor to work in this application. CN: My main goal with the swap was to get a reliable powerplant with a good foundation for future power mods down the line as I improved my driving. There was a decision early on if I wanted to go K20 or K24, or do a Frankenstein K-motor with the K24 block and better breathing K20 head for the best of both worlds. While the torque of the K24 was enticing, I wanted to retain the factory weight balance and lightweight high-revving spirit of the car and chose the lighter and smaller K20. 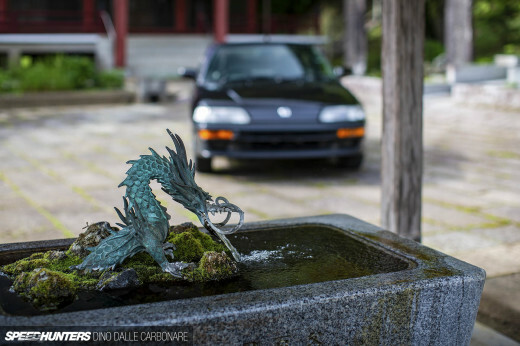 Loi managed to find a low mileage K20A from a JDM DC5 Integra Type R which was perfect for the purpose I intended. It had a better flowing head stock and produced 220hp versus the 200hp in the US RSX Type S K20A2. The swap kit from Innovative included the engine mounts, shifter cables and adapter, axles, and a revised throttle cable. 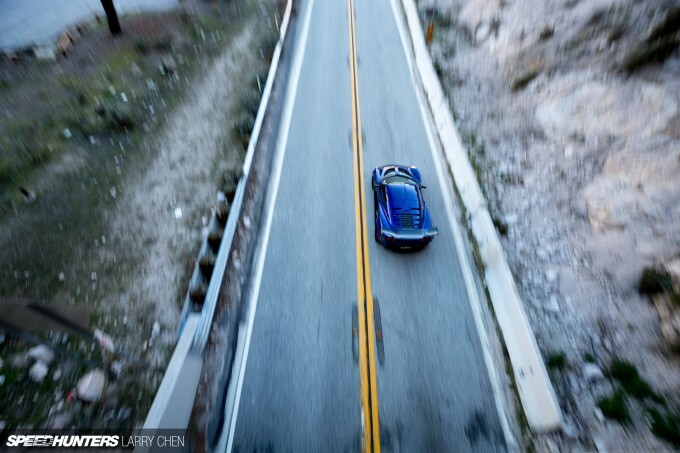 The 2005 car I had already was a throttle cable car, but 2006 and newer versions had drive-by-wire which would require a throttle cable conversion and new pedal box that Innovative also offers. In addition to the swap kit, I also needed an engine management system which would give me greater control over tuning and also successfully communicate the signals to the factory Lotus CANBUS dash. We decided to go with Hondata K-Pro which already offered a specific kit for Lotus applications. The swap also required a custom wiring harness that was provided by a fellow Lotus enthusiast named Murray who had done his own well-documented K-swap on the forums and was willing to help my cause. Fuel would be directed through a K-Tuned fuel rail and Radium fuel pump adapter. 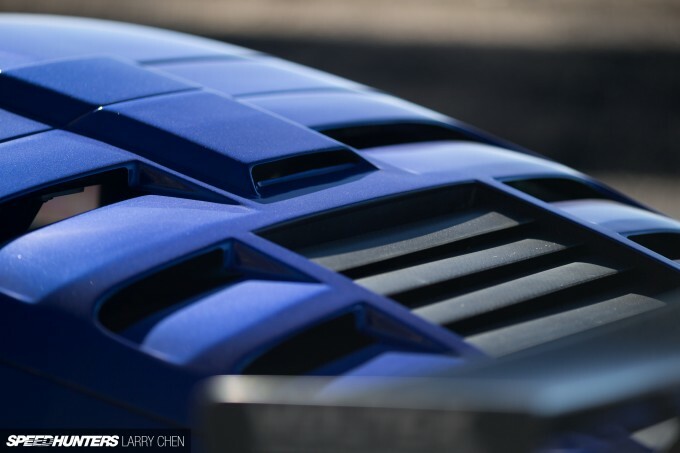 A simple custom cold air intake was created to help the engine breathe better. The stock K20A intake manifold was retained but the exhaust manifold required a custom solution. SH: What were some of the challenges you guys ran into over the course of the engine swap? CN: Initially the plan for our exhaust system was to go with a complete stainless header to muffler system from the reputable builders at Hytech. 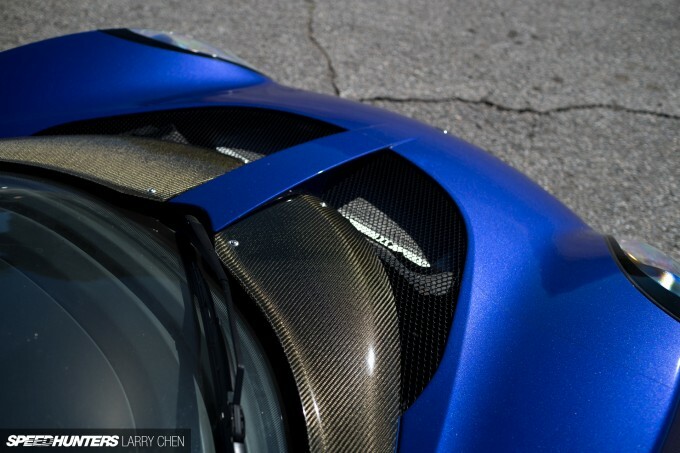 But to help save on cost and time, Tim and Loi sourced an off-the-shelf DC Sports ‘shorty’ exhaust header coupled to a custom mid-pipe that routed to the car’s existing Arqray titanium exhaust. This was then sent to Olympic Powdercoating for a ceramic heat coating. While this did end up being cheaper than the Hytech route, it also ended up taking longer since the mid-pipe was still custom made by Innovative and took more time than expected. Still, I was able to retain the titanium Arqray exhaust and so it probably ended up being the lighter solution too. Another issue that we ran into early on was with the engine mounts not lining up exactly with the motor and the chassis. This required the car to be sent back up to Innovative Mounts in Anaheim from San Diego to get remeasured and refitted. This along with the exhaust build added additional delays to the completion date. But I knew it would all be worth it. SH: Besides the new motor, what other upgrades were done in the engine bay? CN: With the entire guts of the car being removed, I also took the opportunity to upgrade several weak areas of the car. First, to battle future oil starvation, I went with a Clockwise Motion oil pan baffle kit which is a simple drop-in hinged kit that fits into the factory K20 oil pan. Secondly, to reduce fuel starvation, I also went with a baffled fuel tank from V2 Motorsports. Cooling was also an issue I wanted to address, so I upgraded the factory plastic coolant overflow tank to a robust and efficient Radium equivalent. 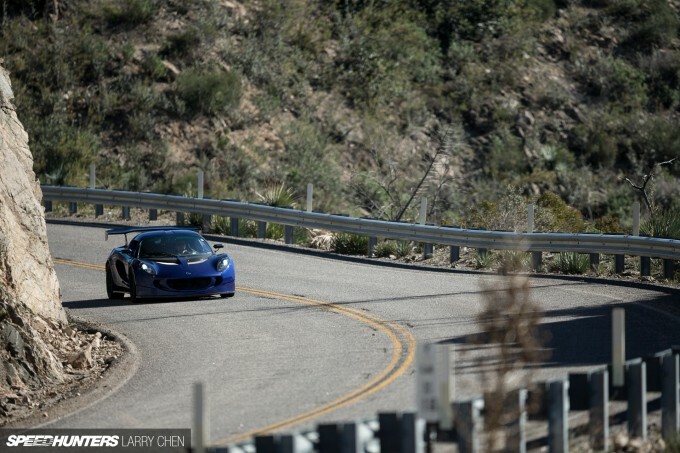 Furthermore, the Lotus came with dual oil coolers housed in the front grilles with long complicated hoses routing to the engine in the rear. These experienced several coupling failures to the point where Lotus had to issue a factory recall on the hoses. I instead decided to forego the entire dual cooler system and go with a single oil cooler in the passenger side intake area. This was a more efficient unit, with less hose length, and better couplings which shed more weight overall. SH: Once the swap was complete, what were your impressions? Power numbers? 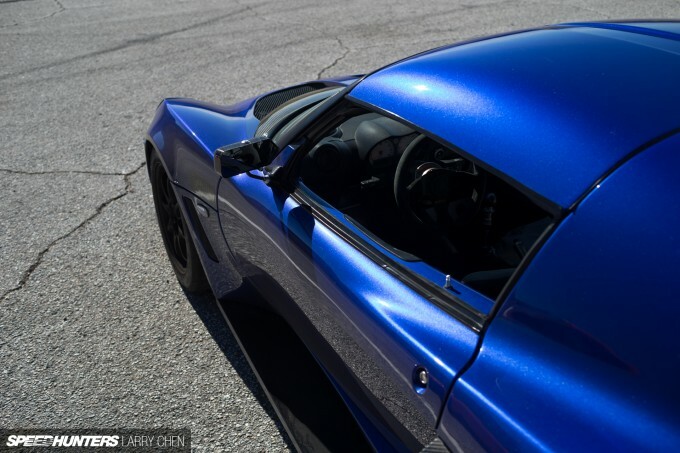 CN: The car was basically being reborn, and rather appropriately the build took a little over 9 months to complete from the initial 2ZZ failure to the first K20A startup. 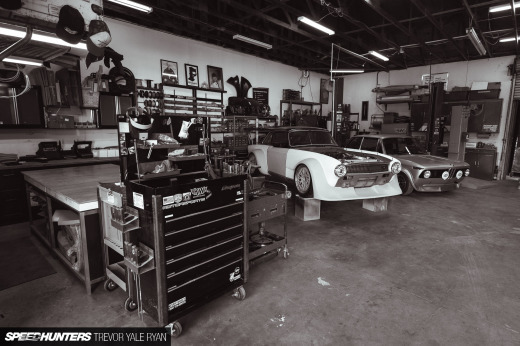 The car was sent to Church Automotive in Torrance, California, for final dyno tuning and it produced 240whp with the relatively tame bolt-ons. The K-series platform has rather large potential even in naturally aspirated form! SH: What other sort of modifications have been done to the car since the motor swap? CN: After the build was completed, I still wasn’t satisfied with the modifications and decided to do a complete rear Exige conversion to match the front end. I was able to source a rare carbon engine cover from Bodyshop Kobayashi in Japan with a design that was meant to accommodate airflow for a large intercooler in forced induction applications. This is possibly something I would consider in the future as I get to grips with the car, but for now the power level is adequate. I also wanted to address the car’s aerodynamics so I went to Evasive Motorsports for a Voltex Type 2 1600mm carbon GT wing and to TWRD in Hong Kong for a carbon GT Front bumper/splitter that is riveted and bolted to the front clam. 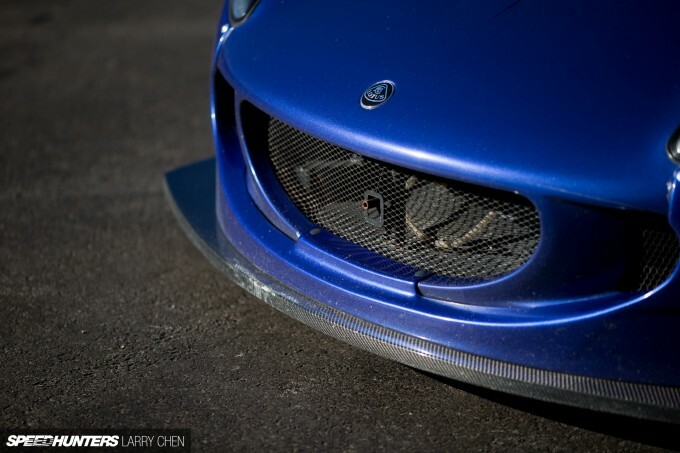 This bumper is wider than the stock clamshell and helps divert air away from the front wheel wells while also providing better front end downforce. Reverie carbon side scoops and rear 3-element diffuser, IMRP side sills, TWRD front access panels and Craft Square carbon side mirrors round out the current aero package. SH: This car has undergone quite a transformation since your first acquired it. What’s next for the project? CN: My ultimate goal is to improve my driving skills and break the 2-minute mark at Buttonwillow’s CW13 configuration. The car is definitely more than capable of it, and now it’s up to me to catch up to its abilities and extract the most from it! In the immediate future, my plans for the car are to upgrade the coilovers to double adjustable Penske units, put in a sixth point in the seat harness, convert to a dedicated AIM dash display/datalogger. 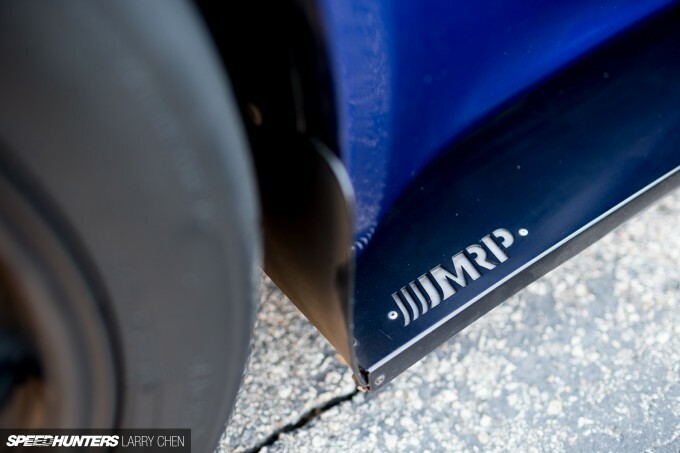 I’ve also toyed with the idea of going down the Liberty Walk or Rocket Bunny route with aggressive over-fenders. If Kato-san or Miura-san are reading this, please make a kit! SH: Closing thoughts? Do you see yourself ever replacing this car with something else? CN: The journey this car has taken me on is something I am very proud of and have learned a lot from. 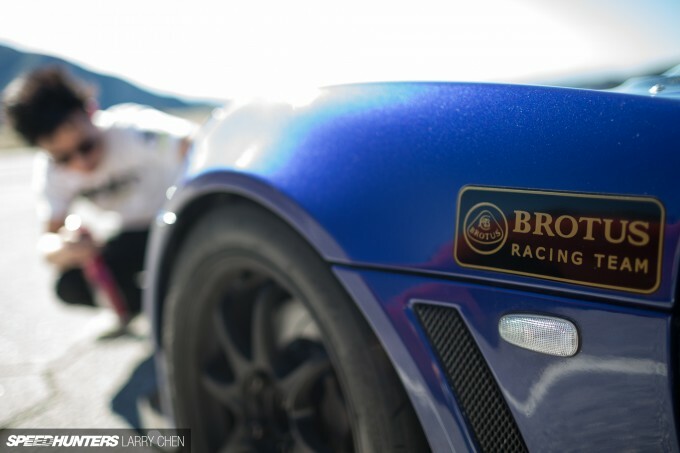 It has allowed me to become a more patient person (the build), a more skillful driver (the track), and also to make friends around the automotive enthusiast community that I might otherwise never have met. Hopefully there’s lots more to come. Nothing in the new market excites me as this car does, except for maybe a V6 Exige. Unfortunately they aren’t sold here in the States and even then, they aren’t as special as the car I have now! 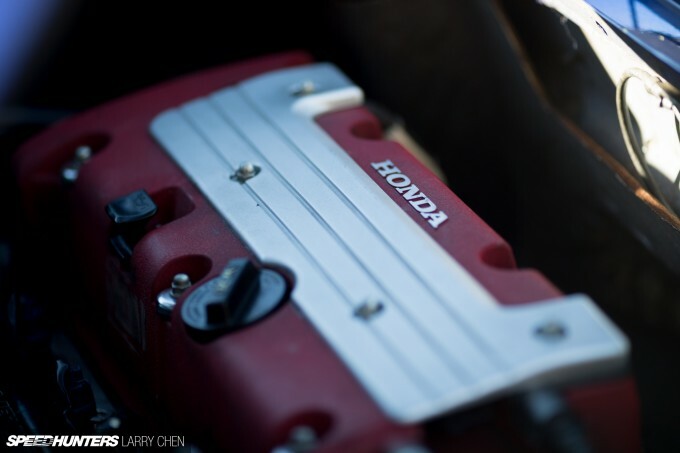 SH: Unlike some motor swaps which completely change the character of a car, a legendary Honda VTEC motor and a featherweight British sportscar is a match made in heaven. 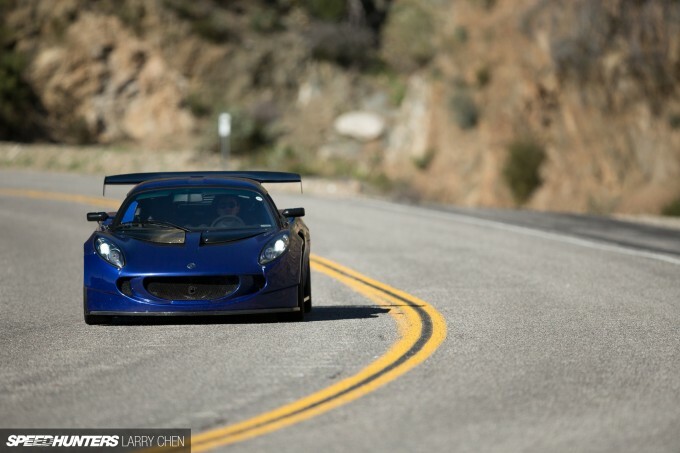 It takes everything that was great about the Elise originally and makes it that much better. 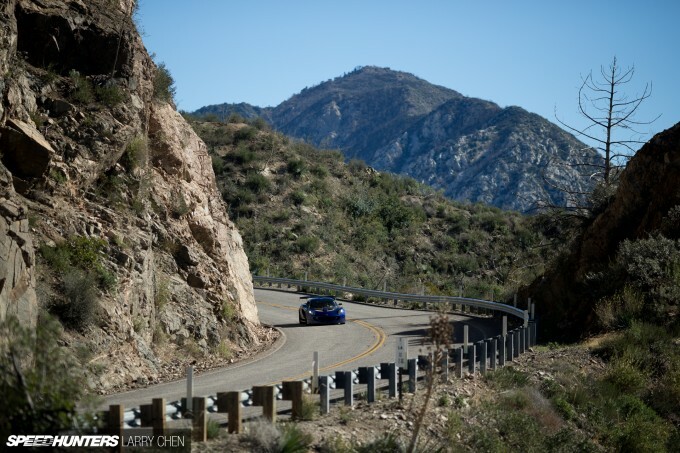 Chris would like to thank Loi Song at Sportcar Motion, Tim at Innovative Mounts, Murray, Mike at Evasive Motorsports, Church Automotive Testing, Julio at Mulholland Motorsports, Harry at A1 Automotive, Brotus Racing Team and his friends and family.